The U.S. Department of Agriculture has launched three programs to provide an aggregate $12 billion of aid to farmers in response to retaliatory duties against America’s section 232 (both metals and autos) and section 301 (Chinese exports) programs. These will take the form of direct payments as well as purchases for food banks, though will likely be a one-off arrangement for the coming 12 months, Politico reports. The most significant part of the program is in reaction to the tariffs and counter-tariffs relating to the section 301 review of Chinese IP practices, as outlined in Panjiva research of June 27 6/27 report as well as the decision to not exempt NAFTA or EU nations from the section 232 duties on steel and aluminum. The move has parallels in Canada’s decision to support its steelworkers. 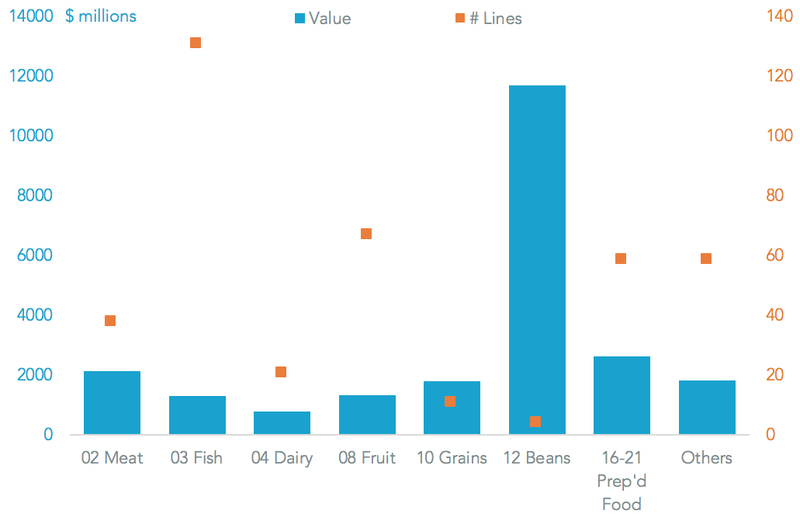 Panjiva analysis shows retaliatory duties have been applied to 390 products (HS-6) by China, Canada the EU and Mexico covering products with an aggregate value of $23.4 billion in the 12 months to May 31. That’s equivalent to 36.0% of all the agricultural exports from America to the four and 19.0% of all American agricultural exports globally. 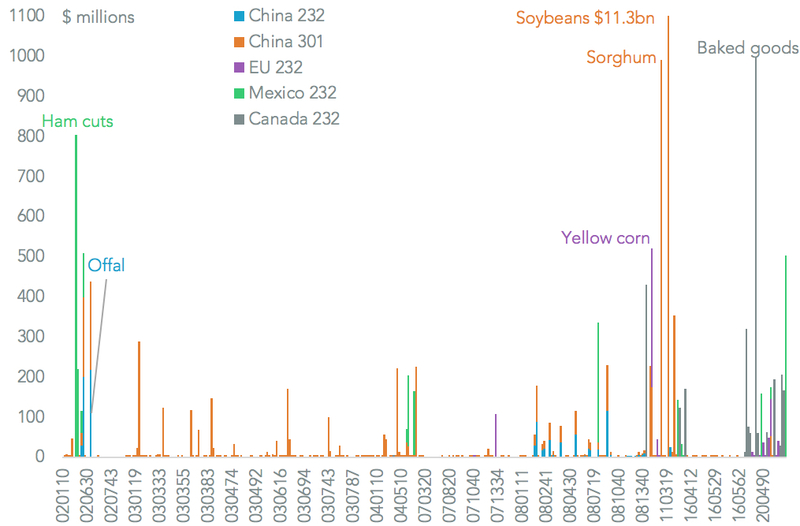 Unsurprisingly the leading product is the $11.3 billion of soybeans covered by China’s retaliation for section 301 duties. The retaliation for that case covered products worth $16.1 billion in total, though China has also sanctioned products worth $992 million (led by pork offal) in relation to the section 232 metals review. Canada has applied the second widest level of duties on products worth $2.9 billion (led by baked products) while Mexico has targeted $2.7 billion with pork being the largest product line. Those two countries duties may be up for negotiation as part of the NAFTA negotiations that are in the process of restarting. 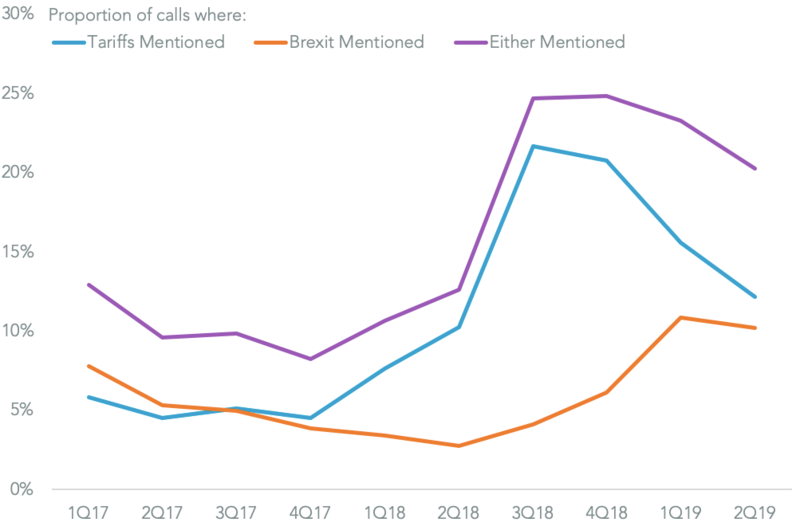 In the case of the European Union duties have been applied to $747 million of products in the agricultural sector, with 47% accounted for by corn. It’s unlikely these will be removed in the near-term despite the apparent rapprochement between President Trump and President Juncker. Other smaller scale products targeted include almonds apples as part of India’s $850 million of products targeted for section 232 retaliation.